Duke freshman Zion Williamson is expected to return for the Blue Devils at some point this season, but coach Mike Krzyzewski doesn't believe it will be in the regular season. After Duke's 71-70 victory against Wake Forest on Tuesday night, the Hall of Fame coach revealed he doesn't expect Williamson, who sustained a mild knee sprain on Feb. 20 against North Carolina, to return in time for Duke's season finale Saturday against the Tar Heels. He does, however, anticipate he'll be back for the postseason -- and potentially as early as the ACC tournament. "He's getting more confidence, and we just have to get him in shape," Krzyzewski said. "I don't think he'll be ready for Saturday. I have to be careful not to push this, but I would be surprised if he wasn't ready by the ACC tournament." 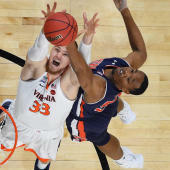 Williamson was diagnosed with a Grade 1 right mild knee sprain when he blew out the right sole of his sneaker on live television in Duke's first matchup against North Carolina. Most knee sprains take roughly two weeks generally to recover from, but the specifics in Williamson's case remain vague. And Duke, in this case, remains extremely cautious not to rush him back too soon. Before Williamson went down, he was unquestionably the frontrunner to win National Player of the Year, and the best player for the then-No. 1 Duke Blue Devils. His absence has shone a light on his importance, too, as Duke has gone 3-1 without him and struggled to blow teams out in the same way it was with him in the lineup. If Duke can get Williamson back at any point -- whether it's the regular season, the ACC tournament or the NCAA Tournament -- it will be the odds-on favorite to win it all this season.